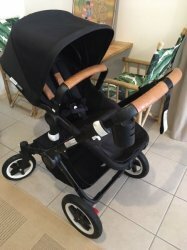 As new All Black Buffalo pram with leather handles and belly bar covers . DOM Aug 2015 model with 5 point harness. Bassinet never used. Extendable black hood.